Here is an elevated view of the center of Future World. This shot was taken from the monorail just prior to making our approach to the station. Disney did a nice job when they designed the park by giving visitors a sneak peak from the monorail. In this picture you can see Spaceship Earth as the focal point with the Fountain of Nations directly in front of it. You can also see the tops of both Innoventions buildings as well as a Kim Possible recruitment center in the lower right corner. If you were to turn 180 degrees, you'd see a beautiful view of World Showcase. I was lucky to get many fun "on-ride" photos on my recent trip. I got excited when our Doom Buggy stopped right here in the Haunted Mansion. The Seance room is very dark and it is nearly impossible to get a clear shot of Madame Leota while moving. When the ride temporarily stopped, I placed the camera on the edge of the vehicle and snapped this shot. A fun little fact about Leota is that the face you see is actually Imagineer Leota Toombs. The voice, however, is Eleanor Audley who was the voice of the evil stepmother from Cinderella and the wicked fairy Maleficent in Sleeping Beauty. When you look at this photo, most of you will probably wonder where this can be found in Spaceship Earth. This is another example of Disney's amazing attention to detail in something that most guests don't see. When this attraction was refurbished in 2007, a scene depicting the invention of the personal computer was added. It takes place in a garage with an audio animatronic figure, who most believe is a cross between Steve Jobs and Steve Wozniak (the co-founders of Apple), creating the first computer. This elaborate scene takes place on the left side of attraction. I have been on Spaceship Earth many times since 2007, and like most guests I've never even thought to look to the right, which is completely dark. Well, on my recent trip something caught my eye and I snapped a quick picture. Much to my amazement, the other side of the garage was illuminated by my flash! This is something that is normally difficult to see because it is barely lit. Disney could have gotten away with simply making this a black wall and 99% of the guests wouldn't know the difference. However, Disney knows that a few of us look for the details, and they do a great job of pleasing us by creating scenes like this. The next time you are on Spaceship Earth, look to the right! As I've mentioned many times, Lou Mongello has been an inspiration for me in my Disney World endeavors. He is a leader in the Disney online community and continues to put out one of the best podcasts in WDW Radio. In fact, it has been voted the "Best Travel Podcast" for the last six years. He is also the author of the Walt Disney World Trivia books and a motivational speaker. One of the best things that Lou does is bring like minded Disney fans together at his Meets of the Month. I was fortunate to chat with Lou a few weeks ago at his January Meet of the Month. It was also nice to meet Lou's family as well as other members of the online community. This particular meet took place in the Magic Kingdom at the Plaza Rose Garden, not far from Cinderella Castle. Lou holds these gatherings at a different location each month, and I highly recommend attending if you are going to be in Walt Disney World when one is scheduled. You can check out the WDW Radio website to find upcoming meets. This is a shot that usually comes out blurry. It isn't easy to get a clear picture when holding a camera over your head, outside of a convertible, while on the fastest ride at Walt Disney World. However, on our most recent visit to Test Track, I got lucky. You can see from the overhead speedometer that we were going 64.7 MPH, which is just about top speed. Although the acceleration on Rock n' Roller Coaster is amazing and the drops on Tower of Terror are fantastic, Test Track is still the fastest ride on property. This attraction is going to close soon for a major refurbishment and is suppose to open with a new theme. I can't wait to see what Disney is going to do with one of its most popular rides. When you think of classic attractions at Hollywood Studios, one of the first that should come to mind is The Great Movie Ride. Like most attractions containing moving ride vehicles, it is not easy to get good photos without using a flash. However, on our most recent trip, we were sitting in the very back row of our moving theater car and I got a couple of interesting shots. I was able to take this picture when the ride stopped in the "gangster" scene. I placed my camera on the vehicle itself to assure that there would be no movement as I snapped the picture. This shot of the abandoned pool hall once again shows the ridiculous attention to detail that Disney puts into everything. It also shows how well they stick to the story and time period of whatever they are portraying. You can see the garbage on the ground (including a beer bottle) as well as the small sign that reads "This place CLOSED for violation of the National Prohibition Act." These are details that most guests don't even notice as their ride vehicles move through the scene. I will be posting a few more shots from The Great Movie Ride in the near future. There are many good Walt Disney World apps available for iPhones and iPads. I have reviewed alot of them in previous posts and I'm constantly looking for more. Several of the apps I've written about have come from the folks over at VersaEdge Software. These include both the Disney World Park Hours app as well as the Disney World Dining app. Today, I'd like to talk about another good one to add to your collection called Disney World Maps. Disney World Maps is exactly what you'd expect and a whole lot more. It is a simple, yet powerful little app that is very useful while walking around the Disney parks. First and foremost, you can choose any of the four major theme parks, as well as Downtown Disney. The entire map for the chosen park pops up on the screen and you can move around with one finger. However, the real usefulness becomes apparent when you "zoom" into any given area. You now have a ton of great information at your fingertips. After zooming into any area of the map, different color coded boxes pop up. Attractions are listed in red, restaurants are in green, and restrooms, first aid, and rentals are all listed in blue. Next to each attraction is a number that represents the current estimated wait time. When you tap on the box it will bring up a picture of the attraction as well as two tabs. The "wait time" tab opens up a window where you can input an actual wait time as well as see recently reported wait times from other guests. The "more info" tab gives a general description of the attraction. The restaurant and restroom boxes work in a similar fashion in that they also provide pictures and general information. In addition to simply looking for an attraction or restaurant on the map, VersaEdge has included a "search" box that allows you to type in a specific place. After typing in your desired location in the box, the map then centers on that attraction or restaurant. It should be pretty obvious how useful the Disney World Maps app can be. In addition to everything that I've already mentioned, it also utilizes the GPS functionality of the iPhone. While in a park, you will see yourself depicted on the map. Also, it ties into the iPhone compass so you can even see which direction you are facing. This is certainly helpful when you need to quickly find a restroom! One of the best things about this great app is the cost. It is only $2.99 for the full version, and if you don't mind a couple of adds at the bottom of the screen, you can get it completely FREE. Also, there is no network connection necessary except for the "Wait Times" data. VersaEdge has done a great job with all of the Disney apps they have created and Disney World Maps is no exception. I highly recommend heading over to the App Store to download it before your next trip! I have been fortunate to ride Kilimanjaro Safaris dozens of times since Animal Kingdom opened back in 1998. However, it was usually the first attraction we would hit in the morning. Every time we would ride past the male lion, he would be asleep. I was beginning to wonder if he might have just been a big stuffed animal! However, on our most recent trip, we rode the Safaris near the end of the day, around 5:00 pm. For the first time, I saw this majestic animal wide awake and pacing on his habitat of giant boulders. It was an amazing site, especially because there are no man-made fences between us. If you want to experience the male lion in all of his glory, I highly suggest riding late in the day. Morocco is a sometimes overlooked pavilion at Epcot, however I find it an interesting place to visit. I have enjoyed dinner at Restaurant Marrakesh on several occasions. The food is good and the belly dancers are entertaining. On our most recent trip, I ate at the Tangerine Cafe for the first time. We sat in the outdoor seating area behind the palm trees in this picture. It is a great place to relax and there is a very nice view of the World Showcase Lagoon. When you walk deeper into Morocco, you really feel like you have been transported to this North African country. You will find several different shops with authentic Moroccan clothing, jewelery, etc. If you listen carefully, you can also hear the recorded sounds of people talking in the apartments above the shops. An interesting fact about this pavilion is that the Tower of Terror, from Hollywood Studios, can be seen from a certain angle when looking across the lagoon at Morocco. For this reason, the top of the Tower was designed so that it blends in with the Moroccan architecture. This is another example of Disney's attention to detail. This photo was taken from a favorite spot of mine which provides a unique view overlooking Fantasyland. I am actually on a second floor, outdoor balcony of the Pinocchio Village Haus restaurant. This is an often overlooked area that only contains a handful of tables. It is fun to look down at the business of Fantasyland while enjoying a sandwich or an ice cream. It is also a neat spot to watch Wishes. Many of the fireworks are launched from behind you, but the explosions sound fantastic! The is a shot of the General Joe Potter, one of three ferry boats that transports guests to and from the Magic Kingdom. I took the photo from the Richard F. Irvine, one of the other ferry boats, as we made our way across the Seven Seas Lagoon. These vessels were named after important individuals in the history of the Walt Disney Company. Each of the boats have a maximum capacity of 600 persons, and they are a great way to travel between the Transportation and Ticket Center and the Magic Kingdom. However, on a cold winter's morning or during a heavy rain storm, I would suggest taking the monorail! Here is a peak at the four passenger contraption that you ride in while on Mission Space at Epcot. You can see the mechanical and hydraulic arms that make this thing rotate forward and backward. On the more intense version of the ride, these "cockpits" also move in a spinning motion on a centrifuge to introduce similar g-forces to those found in real shuttle launches. This is an amazing attraction that everyone who does not suffer from motion sickness should experience at least once. For those who do not feel well while on Mission Space, there are actually "sick sacks" available in each vehicle. There is usually an interesting reaction when unsuspecting guests first notice this. I think the mom in this picture might fall into this category! There are a bunch of great blogs related to Walt Disney World. I have written about many of them over the past year. For the first time, I am going to highlight a blog that is completely dedicated to one theme park. It is called Illuminating Epcot, and I'm pretty sure you can guess which park is featured. 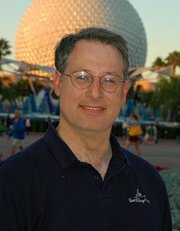 IlluminatingEpcot.com was started back in 2010 by Mark Weaver. He is a huge Disney fan, father, husband and self proclaimed nerd (aren't we all?). He had been going to Walt Disney World for ten years and loved talking about it. Mark's main outlet for his reflections had been his wife Elizabeth, who has become a converted Disney enthusiast and contributor to the blog. He finally decided to publish his thoughts on the internet. He chose his favorite park as the focus and Illuminating Epcot was born. Illuminating Epcot is really two websites in one. First, it is a great place to go for general information about the park. There are tabs across the top that include Epcot History, Future World, World Showcase and Illuminations. There is also a special tab specifically for Spaceship Earth, being the park icon and most significant attraction since Epcot's opening. In addition to the informational aspect of the site, there are also the traditional "blog" articles. These articles are written by Mark and Elizabeth as well as two other contributors. There is Jennifer Ginn, a Disney Vacation Specialist who writes on a variety of Epcot subjects, and Ashleigh who writes articles for the "Food Corner" section of the blog. All four writers do a nice job of bringing us interesting viewpoints and stories related to Walt Disney World's second theme park. As a big Epcot fan myself, I appreciate the material that can be found on IlluminatingEpcot.com. The group puts out a couple articles per week, on average. Like most good Disney blogs, they include some great pictures with each posting. In addition to their opinion and perspectives, they also provide us with timely news info. Most recently, Mark wrote an article about the upcoming Test Track refurbishment. 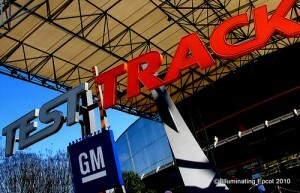 It is here that I learned that this attraction will transform into the new "Chevrolet Design Center." I look forward to learning more about Epcot with each new post. If you are a fan of this park, I highly recommend heading over to IlluminatingEpcot.com! On our most recent trip, I had the opportunity to see the Osborne Spectacle of Dancing Lights for the first time. This is an amazing display that adorns the Streets of America at Hollywood Studios during the holidays. It was started by Jennings Osborne, many years ago, as decorations on his family's home in Arkansas. The display grew year after year until the family generously decided to share their magic in 1995, when Walt Disney World became the new home for this "spectacle." The lights come on every night at dusk and periodically "dance" to upbeat Christmas tunes. Like at Mickey's Very Merry Christmas Party in the Magic Kingdom, it actually snows during the display. For anyone visiting during the holidays, I highly recommend heading over to Hollywood Studios to check out the Osborne Family Spectacle of Dancing Lights. You won't be sorry! This picture was taken while riding Expedition Everest at Animal Kingdom on our recent trip. I twisted my body almost 180 degrees to get this shot. For those of you who have ridden this unique coaster, you know that we were stopped at the top of the hill where the track was destroyed by the Yeti. Seconds after this photo was taken, the train races backwards in complete darkness into the mountain. This attraction is an engineering marvel and is definitely one of my favorite attractions in all of Walt Disney World. This photo from our most recent trip was taken aboard our "clam-mobile" on The Seas with Nemo & Friends at Epcot. Chum the shark is pictured here lurking in the hull of a sunken ship. The technology on this ride is amazing, with the final scene featuring animated characters from the Pixar movie appearing among the live fish in the gigantic saltwater aquarium. At one time, this was the largest aquarium in America. There has been controversy among Disney purists about the infusion of "animated characters" into this pavilion starting in 2004. However, in my opinion, by inserting the entertainment aspect into an otherwise educational attraction, it has brought in a whole new generation of fans. Once inside this huge pavilion, guests still have the opportunity to learn more about marine life and underwater exploration. I think that The Seas with Nemo & Friends is a great example of Disney "edutainment." This is the Main Street fire engine which was parked in front of the railroad station. This photo was taken just after the Magic Kingdom opened on January 6th. If you look closely, you will see that "Engine No. 71" is written on the engine enclosure. I'm sure that many of you Disney World enthusiasts immediately got the reference. Of course it is referring to the fact that Walt Disney World, and more specifically the Magic Kingdom, opened in 1971. You ever wonder what the "other side" of the United Kingdom at Epcot looks like? Well, here's what it looked like on the morning of January 6th as we participated in the 5K. I had a real hard time trying to balance the picture taking with the running. It isn't every day that you get to see backstage areas at a Disney theme park. For a Disney geek like myself, the experience of seeing stuff like this was just as good as participating in the race. This is a view that isn't normally accessible to guests. The World Showcase at Epcot opens at 11:00 am each day, so seeing the sunrise isn't possible. However, during last week's 5K race, we were running through the park at about 7:00 am. I stopped in front of Canada to snap this shot, where you could see the sun rising in between China and Germany. This picture has become my new desktop wallpaper. Even though the Walt Disney World 5K was considered a "race," I had a hard time actually running due to the multitude of great picture opportunities. I found myself stopping every five minutes to take another shot. Much of the race took place in "backstage" areas of Epcot that are normally not accessible to guests. This is an interesting view of Test Track from behind. The raised section of track seen here is the area where the vehicles reach their top speed of about 65 mph. Stay tuned......there are many more 5K pictures to come! One of my greatest pleasures in writing this blog is discovering and enjoying other Walt Disney World fan sites. Over the past year, I have been amazed at how many other talented Disney enthusiasts I have discovered who are sharing their thoughts and ideas using this relatively new technology. Like myself, many of these people are involved in more than one Disney endeavor. This is certainly the case with Chuck Lionberger and his Disney Daddy blog. The Disney Daddy blog started back in September of 2008. Unlike many of us long-time Disney World fans, Chuck had caught the bug more recently. He had only been to the vacation kingdom one time before 2007, and it was nearly 30 years prior. However, after his first trip as a "daddy," he completely caught the bug and took two more family trips in the following year. 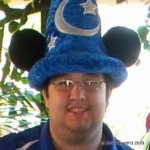 It didn't take Chuck long to become involved in the Disney online community and start his own blog. DisneyDaddy.blogspot.com is where you can find Chuck's writings on the world of Disney. He does a nice job of bringing us interesting stories related to the "most magical place on earth." He talks about everything from attractions, to resorts, to special events. He also has two regular weekly features. First, he has "Tip Tuesday" where he shares useful and insightful tips to help readers get the most out of their Walt Disney World experiences. More recently, Chuck added another great recurring post called "Photo Friday." Much like my DDW Pic of the Day, he features a picture that he personally shot along with a detailed description. Some of these pictures are breathtaking and its pretty clear that he knows a little something about photography. In looking back at some of Disney Daddy's older writings, I found that Chuck and I have something in common. Both of us mentioned the WDW Radio and Inside the Magic podcasts in our very first article. We both talked about how the hosts of these shows had inspired us, and we even thanked them in our posts. 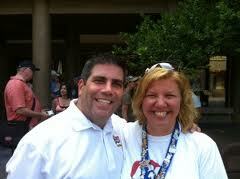 Since our humble beginnings, we have both become friends with Lou Mongello of WDW Radio. Chuck has actually been a guest on Lou's show on several occasions where he has talked about things such as Disney's PhotoPass and pin trading at Disney World. My favorite show that featured Chuck was one about collecting pressed pennies on a Disney vacation. After learning about this phenomenon, I wrote an article all about it in September. In addition to his WDW Radio appearances, he has written articles for Celebrations, a bi-monthly magazine published by Lou Mongello and Tim Foster. In a few short years, Chuck has become very well known in the Disney online community. Although we have alot in common when it comes to our love of Walt Disney World, Chuck and I have one significant difference. Last weekend I ran my first 5K, however he actually completed the full marathon! For those of you who aren't runners, a 5K is approximately three miles where a marathon is over 26 miles. All I can say is that I'm very impressed with his accomplishment and aspire to follow in his footsteps (literally) one day. I also had the pleasure of meeting Chuck over the weekend, and it was very nice chatting with a "colleague" who also ran to raise money for the Make-A-Wish Foundation. He is a real gentleman who is married to Mickey (that is seriously his wife's name). I highly recommend checking out the Disney Daddy blog and any other Disney related stuff that Chuck does in the future. Last week marks the first time that I've visited the ESPN Wide World of Sports complex. This is where all of the runners who were participating in marathon weekend had to pick up their race packets. This complex, located right on Disney World property, is enormous. There are several large sports arenas, including the baseball stadium that is home to the Atlanta Braves during spring training. There are also dozens of outdoor fields and courts located on this huge piece of land. Pay no attention to my fanny pack in this picture. It was the best way for me to carry all of the equipment necessary to bring you the stunning photographs that I post on a daily basis. Oh, and I'm trying to start a fanny pack trend.......it doesn't see to be catching on as quickly as I hoped! This was the view from our room at Kidani Village on our recent trip. Kidani Village is the Disney Vacation Club section of the Animal Kingdom Lodge. The view of the savannah was fantastic. Here we are looking at a breed of cattle known as Ankole. You can also see three giraffes in the background. Throughout our three day stay we spotted additional animals in this area, including ostriches and zebras. This has to be the most unique resort on Walt Disney World property. Even if your not staying here, I highly recommend taking the time to visit! This is the first of many photos that I will be posting from the Walt Disney World 5K that I participated in last week. You can see what it looks like at the start of the race, as we were among over 8,000 runners in the Epcot parking lot at 6:30 am. It was an amazing experience and I took a whole bunch of pictures along the route. Many of these were in "backstage" areas that aren't normally accessible to the public. I will be posting several of these in the near future. There are few theme park attractions as famous as "it's a small world." This attraction in Fantasyland has 289 audio animatronic doll figures representing over 100 nations. However, there are only two that are from North America. This photo, taken in January of 2011, show the cowboy twirling a lasso and the Native American Indian in the "white room" of the attraction. I had the opportunity to ride "it's a small world" last week on my latest Disney World trip, and the Native American wasn't there. I assume that she was temporarily removed for refurbishment. Goofy's Barnstormer was a "kiddie" roller coaster in Mickey's Toontown Fair. It opened on October 1, 1996 and closed last February. This picture was taken only a month before it closed. This is the only Toontown attraction that will remain when the Storybook Circus section of the Fantasyland expansion opens next month. Although the ride will be similar to the original, the theming and name will change. When the new area opens, this ride will be known as The Great Goofini. Today we look back and remember one of the best attractions in the history of Walt Disney World. 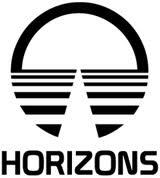 On January 9th, 1999, Horizons closed its doors for the final time. This beloved pavilion in Epcot's Future World opened on October 1st, 1983 and delighted guests for over 15 years. It was one of my favorite attractions and it was a must-do on all of our family vacations. Horizons was a "dark ride" that took guests on a 15 minute journey with scenes that depicted visions of the future. Much like Spaceship Earth or the Magic Kingdom's Haunted Mansion, it utilized Disney's Omnimover ride vehicle system. This allowed for continuous loading and helped to keep wait times to a minimum. Horizons started with a section that showcased visions of the future as perceived from the late 1800s through the 1950s. Next, the ride moved through the "OmniSphere," which was basically a theater made up of two gigantic, curved IMAX movie screens that were eight stories tall by eight stories wide. This section depicted technologies and ideas that could be used to move us into the future. After moving through the OmniSphere, we came to the main focus of the ride. This was a series of scenes showing what life would be like in the future. We would see visions of city life, the desert, under the ocean, and outer space. Like every good attraction, Disney did a great job of telling a story in Horizons. In fact, it is believed to be the sequel to Walt Disney's Carrousel of Progress. 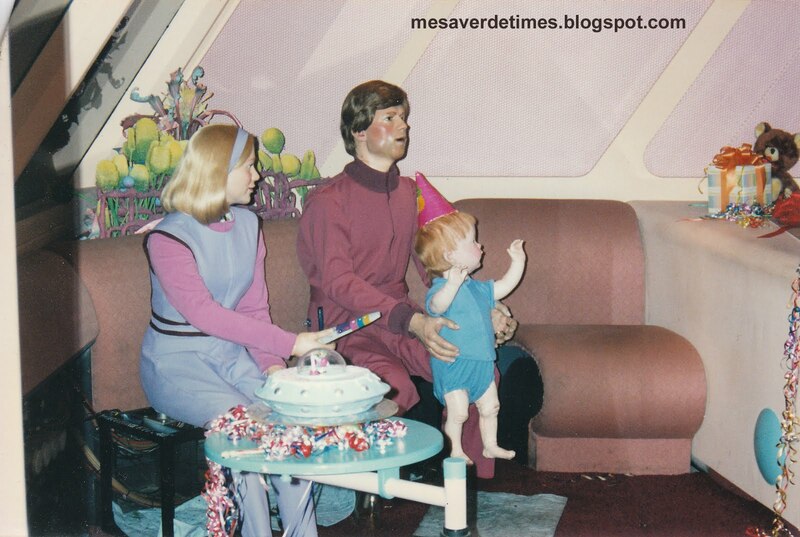 The Horizons story utilized a futuristic family to show guests what might be coming in the 21st century. They featured technologies such as video conferencing and holograms, as well as hovercrafts and space stations. The final section of the ride was groundbreaking. For the first time, Disney gave guests a choice on how they would like their journey to end. Their "shuttle" would take one of three flight paths back to FuturePort, which was the fancy name for the load/unload area. Each rider selected space, desert or undersea from a digital panel on the ride vehicle. Each vehicle held up to 4 guests and majority ruled. The group then took a 30 second "flight simulator" trip to complete their experience. This was incredible technology for 1983. It was always fun to ride Horizons with friends and family, as we'd bicker over how our ride would end. If I got my way, it was always a flight through space! I have wonderful memories of Horizons. My dad took some great video footage of the attraction on our vacation back in 1984, and we spent many hours re-living these memories on tape. There is a scene in the ride where the family is celebrating their son's birthday. It hit close to home when they sang "Happy Birthday to Davey," as it always sounded like they were singing to me! 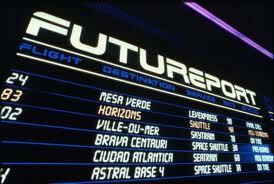 Originally, Horizons was going to be called Century III, to recognize the third century of America. However, Disney didn't think that the name would appeal to international guests, so after much debate they settled on the name Horizons. Many Walt Disney World attractions have corporate sponsors and Horizons was no different. General Electric sponsored this attraction from the beginning and was involved in much of the decision making, including the name. Unfortunately, GE ended its sponsorship in 1994 and the ride temporarily closed. 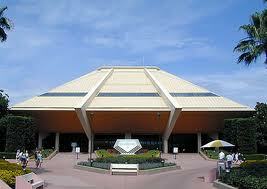 It reopened in 1995, however, due to other Future World attractions going down for refurbishment. 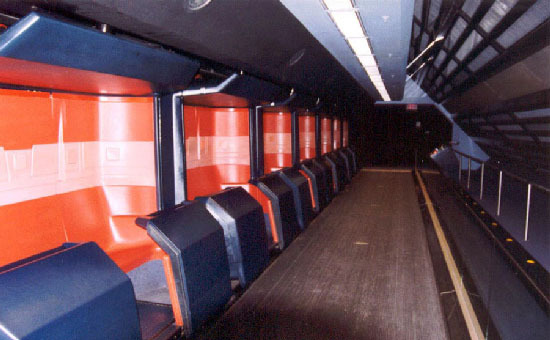 Horizons remained open until Test Track was ready to open to the public in early 1999. On January 9th of that year, Horizons closed forever. In July of 2000, demolition began on the attraction, which marked the first time an entire ride building was demolished to make way for a new attraction. Mission Space opened on this site in August of 2003. It is a fun and unique attraction, but nothing could ever top Horizons, which will live forever in the memories of Walt Disney World fans. I am excited to report that my brother and I completed our first 5K run here at Walt Disney World! It was an amazing experience which I will elaborate on in a future article. We are proud of our accomplishment of making it through unscathed on our first time out. I am even happier that we were able to raise some money to help send a seriously ill child to Walt Disney World. We are still accepting donations and anything you could spare would be greatly appreciated! You can click on the donate button on this page if you'd like to help out. Thanks again for your support! I am taking hundreds of pictures while here at Walt Disney World and will resume normal posting on Monday. Meanwhile, have a Disneyriffic day and remember to keep moving forward! 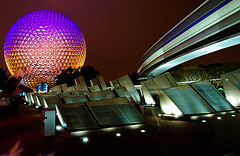 With my "DDW Pic of the Day" series, it should be pretty obvious that I am a big fan of Walt Disney World photography. The "Most Magical Place on Earth" certainly offers some amazing photo opportunities. The most photographed spot in the world is right in front of the Magic Kingdom. My personal Disney World photo library contains over 3,000 pictures and it continues to grow. My wife affectionately refers to my camera as the "girlfriend," and there is no question I have a minor photography obsession. However, as much as I love taking Disney pictures, I must admit that there are others who are also camera savvy. The work of several of these photographers can be found on the WDW Pics App. 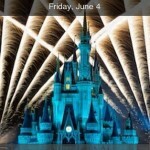 I was recently introduced to the WDW Pics App by my friend Annie who has it on her iPhone. It falls into that category of simple, fun apps that can bring a little Disney Magic to your handheld device. It contains over 100 high quality photos taken from all over Walt Disney World property. Although a majority of these shots are from the parks, there are some really nice ones from the resort hotels as well. My favorites have to be the ones of the fireworks shows. It has always been a challenge for me to get nice, clear fireworks shots with my "basic" camera, so I'm impressed with the high quality ones that are found on the app. There are also a bunch of nice close-up photos as well as several shots that are enhanced with some creative editing. As nice as the WDW Pics App photos are to browse, they also serve another purpose. They can actually be saved to your device and be used as wallpaper. This is a really nice touch as you can change your Disney background to whatever suits your mood. There is also an "order print" button that takes you to the website where you can purchase the actual prints. The app is hosted by the folks over at www.WhereInDisneyWorld.com. The pictures were taken by four talented photographers: Tom Bricker, Cory Disbrow, Paul Gowder, and Matt Pasant. It is available on the iPhone, iPad and iPod Touch. It is also available for Android devices. However, for whatever reason, the quaility is far superior on the Apple products. In addition to the WDW Pics App, this group also puts out the WDW Holiday Pics App, which features great Disney World holiday photos with a focus on Christmas and Halloween. I highly recommend both apps, and at only 99 cents each they are definitely a bargain! This photo from September of 2009 is from the screen in the Spaceship Earth ride vehicle. This is the part where you are infused in the story of "the future" as you descend backwards at the end of the ride. Yes, that is my wife and I depicted in cartoon form. The ride lets you pick some options for how you'd like your future to be, and then gives you a one minute version of what your life could be like. It is a fun use of modern technology! This photo was taken near the entrance to Tomorrowland on the "Avenue of the Planets." This view from April of 2004 was very different than what you'd see just ten years earlier. In 1994, Tomorrowland was re-themed to resemble a galactic spaceport as it would have been envisioned in old comic strips like Buck Rogers or Flash Gordon. Prior to 1994, this was a land of little color. Although I am a Magic Kingdom nostalgic, the newer version of Tomorrowland certainly projects a more "fun" atmosphere. This is yet another example of an amazing encounter you may have aboard the Kilimanjaro Safaris at Animal Kingdom. We are only a few feet away from this prehistoric looking beast that weighs several thousand pounds. It is not behind glass or artificial fencing. Disney does an incredible job of using natural surroundings as a barrier between the animals and guests. I have to be honest though, I saw absolutely NO barriers as we passed by this rhino in January of 2010. Was he an audio-animatronic? .........I think not! The Rock 'n' Roll Beach Club at Pleasure Island was quite a place. I spent many nights partying here, back in my college years. When it first opened in 1989, it was called the XZFR Rockin' Rollerdrome. It wasn't long before Disney decided that mixing rollerskating and drinking might not be the best idea and it was re-themed in 1990. The live rock bands that played here were great and the dance floor was usually packed. Unfortunately, the club closed in early 2008 and the rest of the Pleasure Island nightclubs followed suit by the end of that year. Shortly after this picture was taken in January of 2010, the Rock 'n' Roll Beach Club was demolished. Although it is gone, I will always have great memories of spending time with friends here. 90. Happy New Year and Thank You! Happy New Year! I started Digital Disney World exactly one year ago and I'm very excited to have reached this milestone. When I wrote my first article about Disney podcasts on January 1st, I had no idea what was to come. I was a relatively new blog "reader" and had very little writing experience. Even though I have been a big Walt Disney World enthusiast for most of my life, I was unaware of the huge online community until only a few years ago. Once I started listening to the podcasts and browsing the blogs, I was totally hooked. As a fan of technology, I decided to jump into Disney cyberspace with both feet, and Digital Disney World was born. In the beginning, I was getting a few hundred "pageviews" per month and I was happy that people were actually reading the blog. However, as the year went on, I was blown away by the increase in readers. 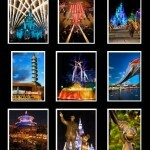 Digital Disney World is now getting between 60 and 100 pageviews per day and it has had over 14,000 pageviews in 2011. I can't even begin to express how grateful I am for this. When I started this blog, it was totally dedicated to highlighing ways to connect to Walt Disney World through modern technology. However, Digital Disney World has grown and evolved quite a bit throughout 2011. Back in February, I started the "On This Date" series to feature important dates in the history of the vacation kingdom. I have tried to sprinkle in these "O.T.D." articles throughout the year and plan on continuing this into 2012. Also, after returning home from our summer trip with more than 500 new photos, I decided it was time to start sharing. In August, I began another new series called the "DDW Pic of the Day." I thought it would be fun to post a different Disney World picture each and every day. These are all photos that I have personally taken over the past ten years, and I include little descriptions with each. I thought it just made sense to start posting "digital" pics on a blog called "Digital Disney World." I will be taking many more pics on my trip next week to add to my library, and I look forward to continuing the DDW Pic of the Day series in 2012. Other than the enjoyment of escaping daily to the blogging universe, Digital Disney World has afforded me the opportunity to befriend many great people in the online community. I have met several of them in person and have corresponded with others using the internet. I want to thank everyone who has continued to encourage and support me in my Disney endeavors. I couldn't possibly mention them all by name, but I need to thank a few who have been inspiring and instrumental to the success of the blog. First and foremost is Lou Mongello of WDW Radio, who continues to be the best example of how to follow your Disney dreams. Next, I'd like to thank Craig and Amy Falk Petermann from The Relocated Tourist blog. They have one of the best Disney blogs on the net and were kind enough to list Digital Disney World as one of their "favorite links." This gave my blog a big boost in readership. I also want to thank all of the other websites that have posted my info, including Sorcerer Radio and Widen Your World. It is greatly appreciated and won't be forgotten. On a personal note, I would like to thank my mom and dad for introducing me to Walt Disney World as a young boy. They truly recognized the importance of spending time together, and helped create many wonderful Disney memories. Finally, I want to thank my incredible wife Melissa. She understands my enthusiasm for Disney World and has been my biggest supporter as I continue to pursue my own Disney dreams. I know of no greater pleasure than spending time with Melissa and our little man, Christopher, on vacation in our favorite place. Since our Disney World honeymoon in 2000, we have created many wonderful memories there, and look forward to many more. Thank you Princess! As I finish this final article of 2011, I have much to look forward to in 2012. I am excited to say that in addition to Digital Disney World, I have two new endeavors that I have embarked on for the new year. First, I have decided to start using my knowledge and experience to help others plan their Disney vacations. I am privileged to have been accepted by Mouse Fan Travel as one of their newest Independent Vacation Planners. I look forward to helping others create their own Disney memories. In addition to booking trips, I have created another business called WDW Guided Tours to help guests see the most that Disney World has to offer in the least amount of time. I give my first official tour next week. It is certainly going to be a busy 2012, and I look forward to what the future is going to bring. Happy New Year to all of you and thanks again for reading Digital Disney World! Labels: Non-Digital Fun, O.T.D. - "On This Date"